It wasn’t always easy, but Gilberto “Zurdo Ramirez got the job done – Ramirez made the fourth successful defense of his WBO super middleweight title, defeating previously unbeaten Alexis Angulo by unanimous decision in front of 5,241 fans at the Chesapeake Energy Arena. The scorecards read 119-109, 119-109, and 120-108 for Ramirez (38-0, 25 KOs), who was stunned on a few occasions by Angulo (23-1, 20 KOs), a heavy hitter from Colombia. Brazil’s first-ever Olympic boxing gold medalist, Robson Conceicao, continued his march in the pro ranks, stopping Gavino Guaman in the third round of their 130-pound fight. Conceicao scored four knockdowns en route to his first stoppage win since last September. There will be blood. A lot of blood. Oklahoma City’s native son, Alex “El Cholo” Saucedo, thrilled the hometown fans with a seventh-round TKO over Lenny Zappavigna in a 140-pound battle. Zappavigna’s corner stopped the bout, but it was a nip-and-tuck affair from the beginning. Saucedo (28-0, 18 KOs) knocked down Zappavigna (37-4, 27 KOs) in the third round, but the Australian came roaring back in the fourth, stunning Saucedo on multiple occasions and nearly scoring the knockout himself. Saucedo, buoyed by chants of “OKC” and “Cholo”, recovered and kept his undefeated record alive. Next up, he hopes, is a world title bout. And, if it happens, Oklahoma City will be in his corner. Mikaela Mayer improved to 6-0 with a dominating six-round unanimous decision over the previously unbeaten Sheena Kaine of Edmonton, Canada. An overhand right dropped Kaine to the canvas in the second round. All three judges scored the fight 60-53. Trey Lippe Morrison made it 15 knockouts in 15 fights, knocking out Byron Polley in the third round. Morrison, son of the late Tommy Morrison, scored five knockdowns before referee Mike England stopped the bout. Former 140-pound world champion Mike Alvarado prevailed in a bloody contest, stopping the game Martin Martinez on cuts after the ninth round of a scheduled 10-rounder. This was the fifth consecutive win for Alvarado. 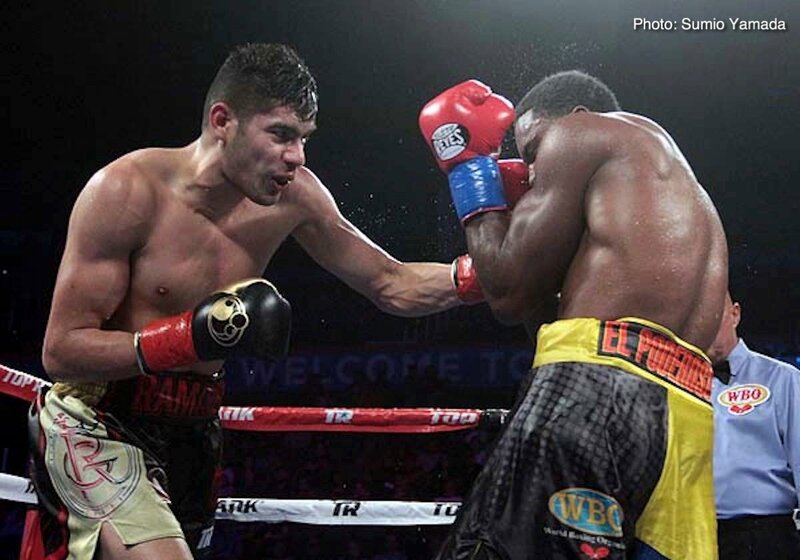 The professional debut of Christopher “The Boy” Zavala was a successful one, as the highly touted amateur bested Tyler Pacheco via unanimous decision in a four-round super featherweight bout. The scorecards read 40-35, 40-35, and 39-36 in favor of the Long Beach, California, native. Oklahoma City native and bantamweight prospect Aaron Morales opened the evening with a four-round unanimous decision over David Martino. All three judges scored the contest 40-36.